Several schools and colleges are shut in view of the bandh call. Jawaharlal Nehru Technological University (JNTU), Kakinada has even postponed all the examinations scheduled to be held on Friday. Hyderabad: The Congress and Communist Party of India (CPI) are participating in a day-long statewide bandh called by Andhra Pradesh Pratyeka Hoda Sadhana Samithi for special category status for the state on Friday. Several schools and colleges are shut in view of the bandh call. Jawaharlal Nehru Technological University (JNTU), Kakinada, has even postponed all the examinations scheduled for the day. Several political parties, including the Telugu Desam, Communist Party of India (Marxist) CPM among others extended support to the bandh call along with state NGOs, secretariat employees, the RTC workers, lorry owners, student organisations and other voluntary organisations. Demanding special category status for Andhra Pradesh, Telugu Desam Party (TDP) MPs donned black dresses to protest against the central government ahead of the presentation of the interim Budget 2019. CPI and the Samiti members staged rasta roko at Pandit Nehru Bus Station in Vijayawada and also in Visakhapatnam to enforce public transport bandh. AP Congress president N Raghuveera Reddy has said that he would stage a protest in Vijayawada. Senior Congress leader Meesala Rajeswara Rao said the Congress activists would participate in the protests across the state. AP Pratyeka Hoda Sadhana Samiti president Chalasani Srinivas has asked the political parties and all organisations to take part in the strike to raise their voice against the Centre. He added that they have requested AP Chief Minister N Chandrababu Naidu to unite all the political parties and stage a protest in Delhi on February 11 for the same. He said that the CM Naidu has also assured that he would also invite opposition party leader YS Jaganmohan Reddy. Meanwhile, AP Secretariat Employees Association president P Muralikrishna, AP NGOs Association leader Bopparaju Venkateswarlu, Telugu Nadu Students Federation president N Brahmam Chowdary and several leaders announced their support to the bandh. The leaders of Andhra Pradesh State Road Transport Corporation (APSRTC) announced protests at bus depots across the state. 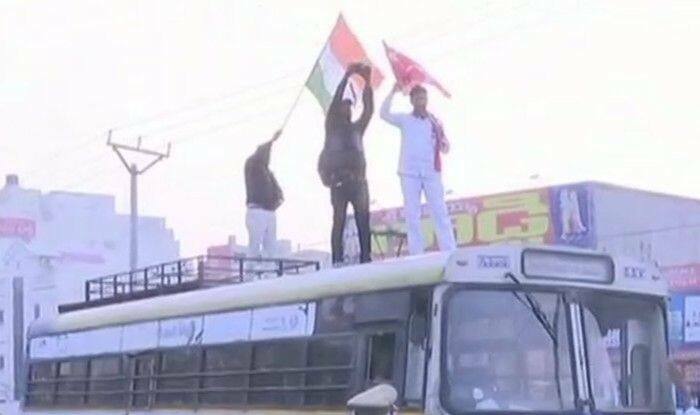 The main Opposition party Yuvajana Sramika Rythu Congress Party (YSRCP) and Jana Sena Party have decided to stay away from the protest.